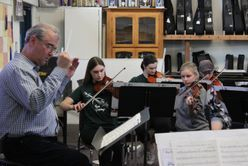 The Yuba Sutter Youth Symphony (YSYS) is made up of students age twenty and younger from the greater Yuba-Sutter area and has been directed by Ted Zalkind since 2014. One of the goals of this organization is to complement, not replace, our area’s school music programs. Thus, all students participating in this group must also be a member of their school music group, unless such a group does not exist. Special circumstances are evaluated by the YSYS board. The YSYS Intermediate Orchestra is a new branch of our organization which we started in September of 2014. The Intermediate Orchestra is a group for students who are new to orchestral playing and would like to gain experience playing in a classical group setting. The orchestra will rehearse from 7:00-8:00pm on Tuesday nights at Yuba City High School, and will be directed by Jan-Roberts Haydon. Students of any age and level are welcome, but they must possess basic sight reading skills, and must be recommended by their school or private music teacher (We strongly suggest that students be graduates of Suzuki Method Book 1, or at an equivalent level). Attendance plays a key role in both of our organizations. Thus, it is very important that both parents and students make a commitment to all rehearsals and performances. The success of our orchestras depends on practicing together as a whole group. All students will be asked to pay a tuition fee to help cover the costs of running YSYS. Tuition for the 2018-2019 year is $160 for YSYS and $60 for YSYS String Orchestra. Tuition will be due at the parent meeting at the beginning of the season. Students will not be allowed to attend their first rehearsal if their tuition is not paid. We hope that you will consider joining us! The YSYS will surely provide new and exciting musical experiences and friendships for all students involved. Please review the Audition Information form if you are interested in participating, and feel free to call Helen Graham (530.300.4189) if you have additional questions.